March 7, 2017, 6–8 p.m.
How can visual art transform our understandings of protest, value and change? This visual arts summit offers an open discussion to explore how the visual arts provides lessons for understanding protest, value and change in today’s volatile world. Panelists will discuss varieties of contemporary visual art today; the importance of risk-taking and failure; how artists channel and utilize creativity; and how the visual arts benefit more and more sectors in social, political, and economic worlds. 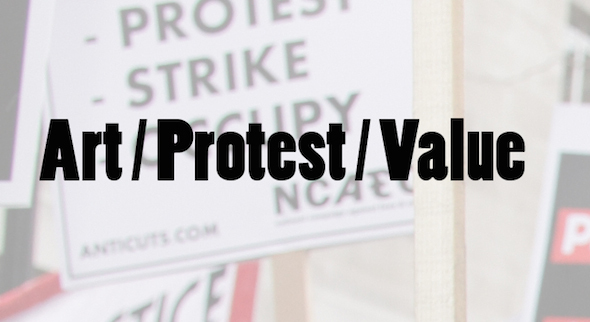 Art / Protest / Value Dissolve Inequality: A Visual Arts Summit, sponsored jointly by the MIT LIst Visual Arts Center and the MIT SHASS Global Studies and Language program, takes place March 7, 2017, 6–8 p.m. in Bartos Theater MIT Building E15. This program serves as the book launch for The Artist as Culture Producer: Living and Sustaining a Creative Life, which is a collection of essays by 40 visual artists. The publication will be available for purchase at the event. Sharon M. Louden is an artist, educator, advocate for artists, and editor of the Living and Sustaining a Creative Life series of books. She graduated with a BFA from the School of the Art Institute of Chicago and an MFA from Yale University School of Art. Her work is held in major public and private collections, including the Whitney Museum of American Art, National Gallery of Art, and the Museum of Fine Arts, Houston. She has taught for more than 25 years and is currently the Senior Critic at the New York Academy of Art where she organizes a popular lecture series interviewing luminaries and exceptional individuals in the art world. Hrag Vartanian is editor-in-chief and co-founder of Hyperallergic, a publication he created in 2009 in response to the changes in the art world, publishing, and the distribution of information. He writes and lectures about contemporary art, performance, multiculturalism, politics, the internet, literature, and visual culture. His curatorial interests are focused on theories and practices of decolonization and he prefers to work in unorthodox spaces. Vartanian launched the Hyperallergic Podcast in 2016 which travels around the globe to uncover the evolving world of art. Julia Kunin lives in Brooklyn, NY. She earned a B.A. from Wellesley College and an M.F.A. from The Mason Gross School of the Arts at Rutgers University. Julia Kunin’s work is represented by Sandra Gering Inc. Gallery where she had a solo show entitled “Les Guerilleres”, in 2015. Kunin has exhibited nationally and internationally. Kunin was a Fulbright Scholar to Hungary in 2013. Kunin was a member of the Women’s Action Coalition, and is a founding member of the activist group “We Make America." Ian Condry is Professor of Japanese Cultural Studies in the Global Studies and Languages Program at MIT, and author of The Soul of Anime and Hip-Hop Japan. He is founder of the Dissolve Inequality project at MIT, and co-inventor of the Mobile Protest Disco sound experiment.